That’s been the mission of NARA, the Northwest Advanced Renewables Alliance, a $40 million, USDA-funded project led by Washington State University. Using readily available biomass from timber in the Pacific Northwest, this international collaboration of private industry and research universities has spent the past five years figuring out how to bootstrap a bioeconomy into existence—one that would fuel our jets, meet our needs for plastics, medicines, and fabrics, and teach us new ways to sustainably manage our forests. Regionally based chemical and energy production will also do wonders for the American economy, as we revitalize old mills, and repurpose refineries to process plants grown locally. One such biorefinery in Cosmopolis could herald the timber industry’s future. The story of NARA’s five-year journey, its challenges, and its successes begins more than a hundred years ago, when timber towns like those in the Grays Harbor area were in their heyday. NARA director Mike Wolcott, photo Shelly Hanks. A hundred or more years ago, we had plastic—but it wasn’t a byproduct of the petroleum industry, it was made from cellulose. 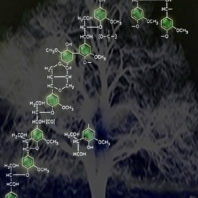 And cellulose comes from trees. It’s that glad-handing carbon that we’re trying to get, well, a handle on. As carbon dioxide, methane, and a host of other gases, carbon is creating a way-too-cozy blanket in the earth’s atmosphere and warming the whole place up. One cause of this greenhouse effect is the ancient carbon we’re taking out of the ground—as oil and coal—and turning into fertilizers to grow our food; pesticides to keep bugs, fungi, and bacteria from getting our food before we do; fuel for our cars, trucks, boats, and planes; and plastics plus a million other useful chemicals. With plants, though, we are recycling carbon already in circulation in the biosphere. All those products and chemicals we depend on can come from trees and other plants. Cellulose is full of sugar, and sugar is a great source of easily accessed carbon. Sugars can be used to make medicines, plastics, fuels, fabrics, and a lot more. If you show a pile of sugars to a horde of hungry yeast, you’ll soon have a tank full of alcohol to, say, produce the fuel to fly a jet. I sat down with NARA director Mike Wolcott in his office in the PACCAR Environmental Technology Building on the Pullman campus to talk about the NARA project. 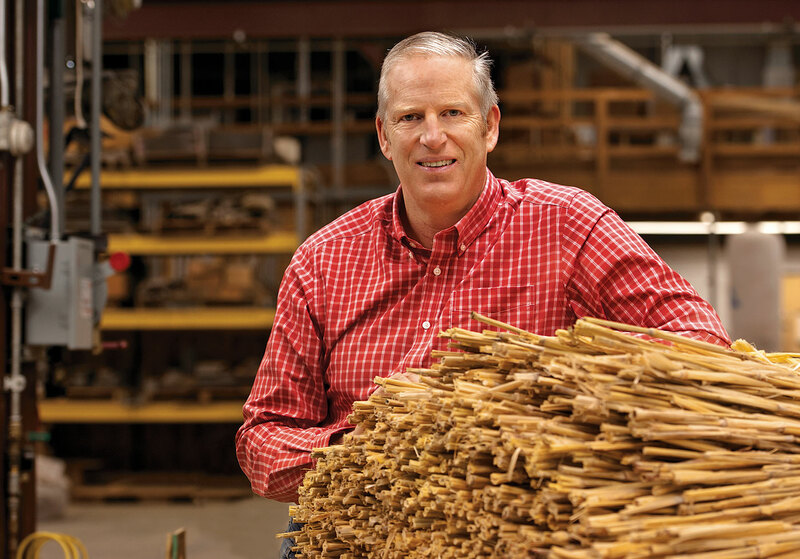 Wolcott’s a big guy with big ideas, and he’s known as one of the top wood composites people in the world. That’s saying something at WSU, considering researchers here commercialized or invented plywood and many other types of composite wood materials that are now staples of the building industry. With NARA, “we’ve come full circle,” says Wolcott, a Regents professor in civil and environmental engineering. Jet fuel from forest slash—the residues made up of the branches, bark, and other bits left after logs are harvested—recombines two major threads of the Pacific Northwest economy: aviation and forest products. Recombines because, as Wolcott points out, the first planes were made of spruce grown in Washington. He argues that the Pacific Northwest has the resources, knowledge base, appetite, and passion to make change happen and to lead the world into a bio-based future. The economics of bioenergy, specifically, but a bioeconomy more generally, are tricky. “The chemical needs are a lot more plausible than the energy needs because we artificially keep energy cheap,” says Wolcott. Five years ago, when oil was around $100 a barrel, it looked liked a fuel-centric bioeconomy could get off the ground. Now, the push is to make wood the new black—to mimic, in a sense, the business model of the petroleum industry. That’s why USDA’s National Institute for Food and Agriculture (NIFA) funds projects for “bioproducts that enable the fuels development,” Wolcott says. 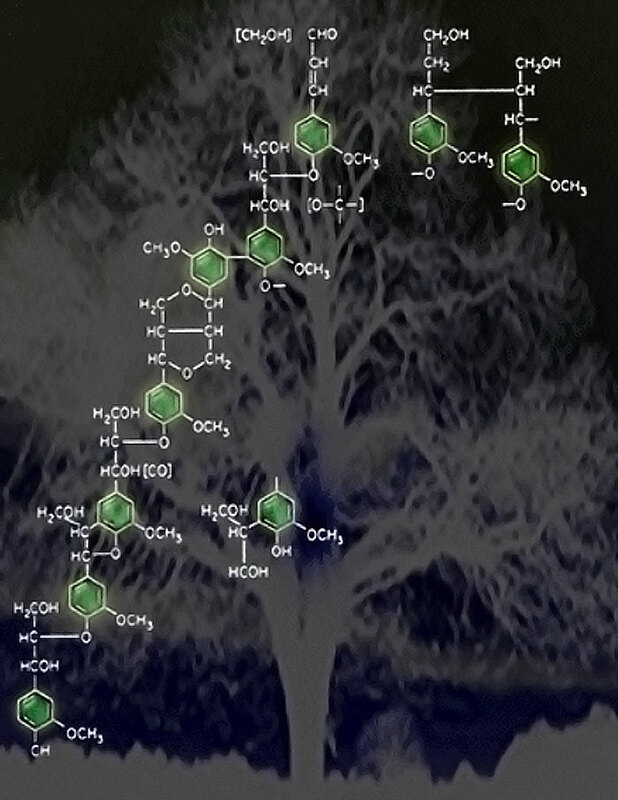 The sugars in cellulose make fuels and other chemicals, but lignins are also available to make a wide variety of coproducts, as they are known in the NARA world. Lignins are the scaffolds that allow plants to defy gravity, grow vertically, and compete for sunlight. They’re the woodiness of wood, critical in the evolution of plants as they moved from aquatic to terrestrial environments. Lignins are used in a huge range of chemical products in industrial and agricultural processes, including dispersants, surfactants, adhesives, emulsifiers, binders, thermosets, as well as, in highly purified forms, cosmetic and food additives. Simo Sarkanen, a NARA team member and a professor of bioproducts and biosystems engineering at the University of Minnesota, has figured out how to make “materials that are better than polystyrene” with lignins. 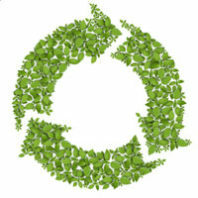 Polystyrene is used in packing materials, DVD cases, to-go boxes and millions more products. As we transition from an oil-based economy to the new bioeconomy, we’re going to need to retool and reopen the currently shuttered infrastructure of the old timber industry. It could restore a lot of jobs in regions that were hit hard by the long, slow deindustrialization of America. I am riding around in a pickup with Larry Davis, director of fiber resources for Cosmo Specialty Fiber, a NARA partner. Davis is telling me about Cosmo’s operation, which uses locally sourced hemlock chips to make cellulosic raw materials for manufacturers. 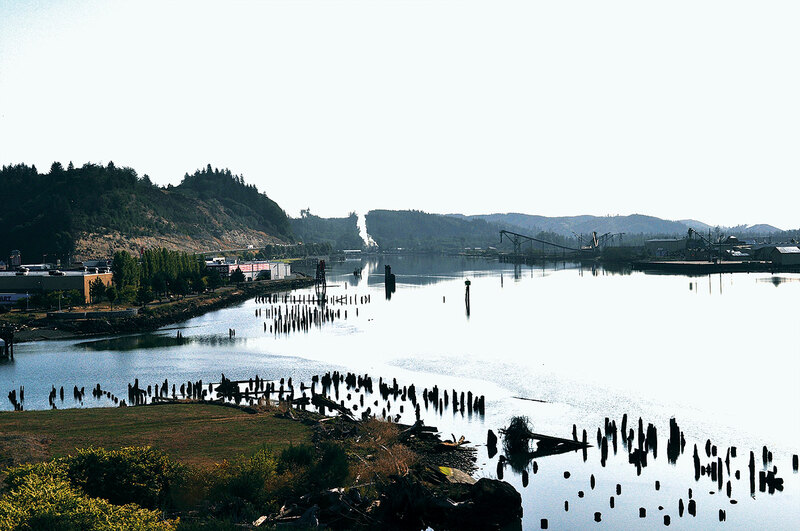 We pass a church on a corner, and the marquee proclaims, “God is not mad at you.” In Aberdeen, Cosmopolis, and Hoquiam, we roll past shuttered mills and deserted brownfields where once flourishing mills were ripped out by their roots. God’s not mad but you can see why people might be harboring doubts. Davis drives along the Chehalis River, pointing out the rotting pilings sticking out of the water. “This really was once the timber capital of the world,” he says. “A hundred years ago,” he continues, “those pilings would have supported decks. And the decks would have been piled high with logs.” In Grays Harbor alone, between 1906 and 1907, nearly 500 million board feet of timber shipped out on 600 steam and sail-powered ships. Millions more board feet moved east on railroads. In 1935, at the peak of the Depression, unions in the region attracted some 70,000 timber workers. By the 1990s, timber employment in the region had declined by about 50,000 jobs. If there’s a cloud hanging over the Grays Harbor area, Cosmo is a silver lining. In 2006, Weyerhaeuser owned this pulp mill in the heart of Cosmopolis—and then shut it down. In 2011, an equity firm bought the mill, reopened it, and created about 200 jobs, many for workers who’d been laid off when the mill closed a few years earlier. The mill takes wood chips and makes “dissolving pulp,” Cosmo’s contracting and purchasing manager Sandy Corrion tells me. It’s not made into paper. Instead, this pulp is dissolved into a homogenous solution, making it ideal for subsequent processes requiring a high cellulose content. Cosmo sells their pulp to manufacturers who spin it into textile fibers, mainly viscose, as well as other products. I’d heard her talk at a NARA-hosted biofuels and coproducts conference a couple months before we meet and was fascinated by the concept of “byproduct synergy” she presented. It turns out that not all waste is trash. Like the logging residuals the NARA partnership turns into fuel and coproducts, Corrion wants Cosmo’s residual outputs to be another company’s raw materials. For Cosmo, moving into the biochemicals market is smart. They’ve got valuable sugars in their waste stream. Finding ways to get those sugars into the market would increase revenues and reduce effluent treatment costs. “Sustainability cannot be studied in a laboratory because it is inherently a function of communities,” says Wolcott. It can’t be taught in a classroom, either, which is why WSU’s Integrated Design Experience (IDX) tackles real-world projects in a community-based course. IDX brings together students and faculty from landscape architecture, interior design, architecture, the engineering disciplines and construction management, business, bioregional planning, and agriculture with community members. Working with NARA researchers, IDX students from WSU and the University of Idaho analyzed regional supply chains for biofuels. As the Pacific Northwest continues to move towards a bioeconomy, where will mills and biorefineries be sited? And where will raw materials be extracted and gathered? And do locals even want that once thriving infrastructure brought back to life? Undergraduate and graduate students, along with faculty and industry mentors, gathered and presented findings on everything from how government policy affects an emerging industrial bioeconomy to recommendations for mill and depot siting. Students interviewed community members in likely refinery and depot locations to ascertain local willingness to support retooled mills. Most communities are enthusiastic about breathing new life into those facilities. Wolcott makes a couple great points about involving IDX students in NARA’s work. First, he says, who doesn’t want to help a student? “Giving back to students is motherhood and apple pie. So students can waltz in and get people’s attention and assistance far better than I can.” Community members move from passive clients to involved partners in the project. NARA’s capstone project was to produce a thousand gallons of jet fuel and have a major airline fly a commercial flight with it. It was a daunting task, because previous “proof of concept” work was at the lab-bench scale. NARA’s commercial-scale production partners had to get creative by tweaking machines and processes. Critically, too, the fuel had to be certified by an international standards board. And, finally, NARA had to find an airline willing to fly on the stuff. It’s all coming together. The fuel was made. The fuel was certified. And Alaska Airlines has agreed to fly from Seattle to Washington, D.C., to demonstrate that Pacific Northwest wood can indeed once again take wing. But a commercial flight is really just the leading edge of something much more important and world changing. Massive amounts of brainpower, along with private and public money, have gone into investigating plants’ abilities to supply us with fuel and the starter chemicals required by key industries. The prospects are positive, both economically and environmentally. We can produce fuels and chemicals that won’t compete with food production. The market for alternative fuels is growing. The U.S. military wants to steam a green fleet and fly a green air force on biofuels. 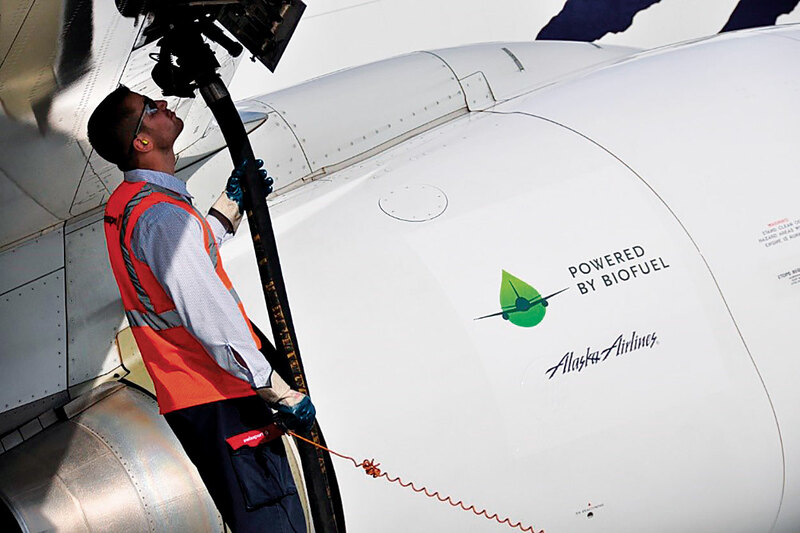 Airlines want alternative fuels in order to continue offering service to countries, like those in the European Union, with increasingly stringent carbon-footprint regulations. Environmentalists want alternatives to cumulative toxins released by the manufacture and degradation of plastics. Communities throughout the United States, like Aberdeen, want stable and sustainable economic foundations that offer living wages. Bill Goldner, USDA-NIFA’s acting director for sustainable bioenergy, says, “I’ve got a six-year-old. When I look at the future of everything we’re doing, we’re doing it because of them. We want them to have a world that’s worth living in, environmentally. Wolcott runs a hand through his shock of pale-as-spruce hair, and reflects on the winding path that brought him to this project. Like Goldner, he says his kids are at an age where they are asking themselves, “What am I going to do?” Their musings bring his own past to mind. “I’ve always been a maker,” he says, but with a strong love of the environment, too. Wolcott was gradually pushed and pulled towards trees’ inner chemistry set and wood’s energy potential. From work in forestry, “I finally went into materials engineering and got more interested in making a variety of things from that raw material rather than this,” he says, rapping the wooden top of his desk. That’s a familiar refrain among members of the NARA project. Doug Rivers, director of research and development for Kansas-based biorefinery ICM, a NARA partner, recently said that when he worked for Gulf Oil in the 1970s, they built a prototype biorefinery because they were not going to be held hostage by anybody. Wolcott, too, talks about the oil embargo of the 1970s as a strong motivator of the course of his own and others’ careers. All over the United States, NARA and similar USDA-funded projects explore the use of available biomass for energy production: pines killed by beetles in the Rockies, energy cane (a variety of sugar cane bred for high fiber content) and sweet sorghum in the Southeast, switch grass in the Midwest, shrub willow and other woody crops in the Northeast. The USDA didn’t just pump money into research but put millions into education on energy literacy, as well. “We want young people to know about this stuff from an early age, and to think about careers, not just as scientists, but also as practitioners, farmers, and processors,” says Goldner. 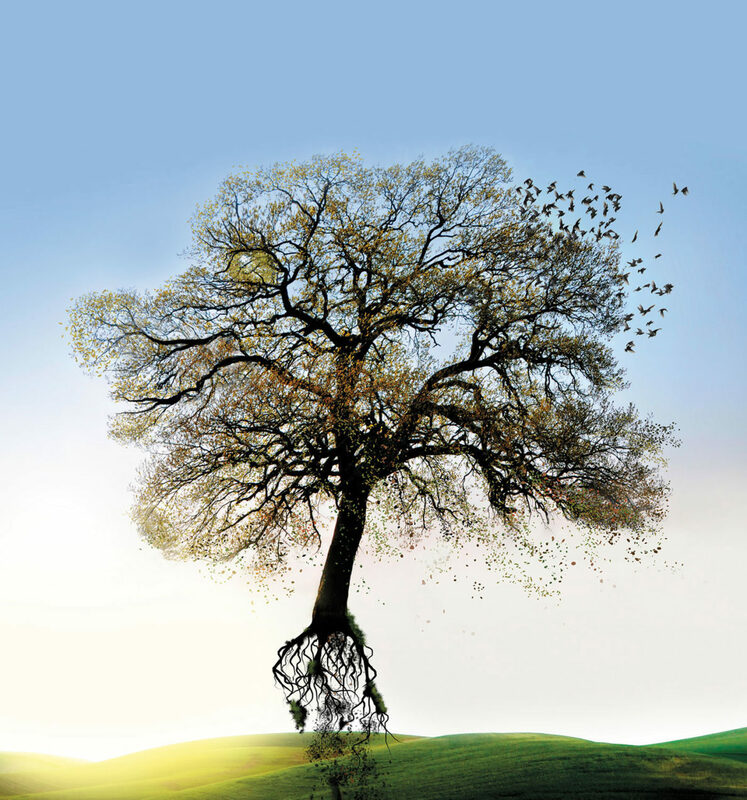 The next time you walk past a tree in your neighborhood, maybe you’ll look at it in a new way. Trees—and, more generally, plants of many kinds—provide the renewable resources that bring us pleasant shade, treehouses for our children, and tall timber buildings for our businesses, as well as the chemicals we need to maintain our energy-intensive civilization. Forest-powered biofuel flight heads to Washington, D.C.